Parents as well as teachers & therapists working with ADHD-diagnosed children and adolescents were wanted for a non-medication, alternative therapy, 6-week ADHD research study. Children taking medication for ADHD and those currently not doing so were eligible. This study took place across the US in children’s homes, schools and therapist offices. It is estimated that 3-5% of school-age children in the US are diagnosed with ADHD, making this the most commonly diagnosed psycho-social disorder in childhood (Shaw, 2007). The DSM IV-R outlines three general categories of symptoms that are characteristic of this condition; hyperactivity, impulsivity and inattention. Over the past 20 years, compelling anecdotal reports were made to Relax4Life from teachers introducing children to the Intuipath® double finger labyrinth design (a mirror-image, inlaid wood labyrinth design involving the use of both hands simultaneously moving in opposite directions.) Reportedly following recess periods, children using the Intuipath® appeared to calm down quickly which led to better attention span, mental focus and greater impulse control. It has been suggested previously that the Intuipath® design stimulates both sides of the brain simultaneously, thereby pairing reasoning, problem solving and language skills (left hemisphere) with intuition and creativity (right hemisphere). This effect, known as Brain Synchrony, creates a preponderance of alpha and theta brainwave states, leading to enhanced mental relaxation (Fehmi & Fritz, 1980; Hutchison, 1994; Harris, 2002). Discussions with Occupational & Physical Therapists strongly indicate that simultaneously engaging both sides of the brain (by moving limbs from both sides of the body simultaneously, creating Brain Synchrony) can lead to functional brain pathways in one hemisphere, finding ways to take over the workload of weak or dysfunctional pathways in the same or opposite hemisphere. Furthermore, mental relaxation (brought on by Brain Synchrony) is one of the keys to children developing and demonstrating greater adaptive responses and choices to various environmental stimuli. This ability is known as Sensory Integration (Ayres, 1979). The research question was whether children diagnosed with ADHD or ADD with Hyperactivity, who use an Intuipath® finger labyrinth (to develop mental relaxation brought on by Brain Synchrony) for a specified amount of time, will show a reduction in the behavioral symptoms associated with this condition (hyperactivity, impulsivity and inattention) over ADHD-diagnosed children who engage in a similar activity for the same amount of time. Participating children, (ages 7-17) diagnosed with ADHD or ADD with Hyperactivity, were categorized based on whether or not they were currently taking medication for the condition. Those currently not undergoing behavior-altering medication therapy (or who have ceased behavior-altering medication therapy a month or more before) made up Groups 1 & 2. Those currently taking behavior-altering medication for the condition comprised Groups 3 & 4. Children in Groups 1 and 3 were verbally trained (by a parent, teacher or therapist using a standard script) on how to “play” simultaneously (using a finger from each hand) with a Children’s Cretan Intuipath® design. Study participants were supervised in this activity at approximately the same time each day, for 5 minutes per session, from 3-5 times/week for 4 consecutive weeks. The unstained, compressed wood material that the design was made from afforded a light sandy tactile sensation in the finger grooves and therefore was felt to be a tactile-rich way to engage these children in the activity. Children in Groups 2 & 4 received a tray filled with an inch or more of sand and were briefly instructed (by a parent, teacher or therapist using a standard script) to move a finger of both hands through the sand anyway they wanted at approximately the same time each day, for a period of 5 minutes, 3-5 times/week for 4 consecutive weeks. A behavioral observation rating scale (the ADHD-SRS, Holland, Gimpel & Merrell, 2001) that focused on the severity of the targeted behaviors (attention span, impulse control, mental focus and the ability to sit quietly) were filled out by either a parent, teacher or therapist on each child before the study began, at the end of the 4-week treatment phase and again at 6 weeks to determine any continuing effects. The rating scale consisted of 56 items that have been normed with high validity and reliability on children ages 5-18. The scale typically took from 10-15 minutes to complete each time. 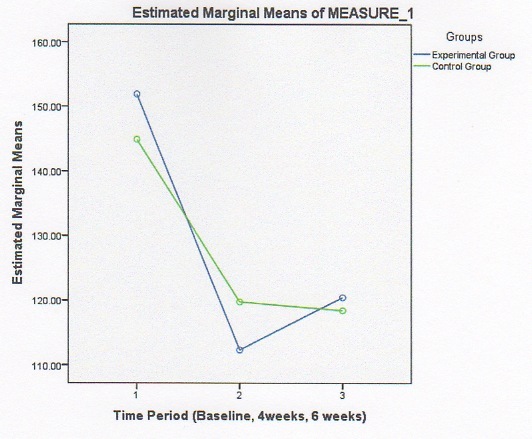 A statistical analysis was then performed to determine any statistically significant changes among the 4 groups before the treatment phase (control groups) at 4 weeks (post treatment phase) and again 2-weeks post treatment. 1) Ayres, A.J. (1979). Sensory integration & the child. Los Angeles: Western Psychological Services. 2) Fehmi, L., & Fritz, G. (1980). Open focus: The attentional foundation of health & wellbeing. Somatics, 2, p. 34-40. 4) Hutchison, M. (1994). Megabrain power. New York: Hyperion. 5) Shaw, P. (2007). Attention-deficit/hyperactivity disorder is characterized by a delay in cortical maturation. Online Proceedings of the National Academy of Sciences, December 4. 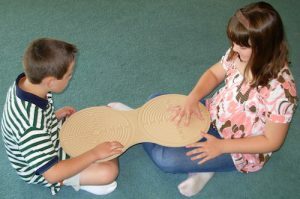 The Intuipath is a mirror-image, double finger labyrinth wooden board designed for simultaneous use by both hands to activate and balance the left and right sides of the brain. Physical and Occupational Therapists suggest that using the right and left sides of the brain simultaneously has a positive affect on mood, behavior and stress management. After 10 years of Intuipath use across the US, many parents, teachers and therapists reported positive effects from using the Intuipath with children. Therefore, in April 2008, at the urging of Dr. Lauren Artress, the pioneering voice of the labyrinth movement worldwide, Relax4life embarked on a national research study to determine if the reported benefits of the Intuipath could be validated scientifically. We invited adults (parents, teachers and therapists) to observe children, ages 7-17, diagnosed with ADHD. Some of these children took medication to manage their ADHD symptoms. The children were instructed to play with either a Children’s Cretan Intuipath or in a sand tray at home, in school or in a therapist’s office for 4 weeks. The Intuipath and sand tray combination were chosen for the study as they both have a light sandy tactile feeling when used. The researchers wanted to be able rule out this tactile stimuli as a variable for behavior change. The study involved each child being observed playing exclusively with either the Intuipath or sand tray for 5 minutes at a time simultaneously, 3-5 times per week for a 4-week period. After 4 weeks, the Intuipath® or sand tray was discontinued. A symptom rating scale known as the ADHD-SRS was used to measure the child’s behavior at baseline, at the conclusion of the 4 week intervention and lastly at the completion of the 6th week (i.e. two weeks after the intervention ceased). The scale which is norm referenced, contains 56 items, including two subscales, hyperactivity and inattention. It provides a thorough and complete assessment of ADHD symptoms based on the Diagnostic & Statistical Manual-4th edition criteria. The parent/rater was instructed to fill out the scale prior to the introduction of the intuipath or the sand tray. This marked the baseline or “time 1.” The rater was then instructed to fill out the scale both at the end of the four week playing phase (“time 2”) and the six week mark (“time 3”). The rating scale took approximately 10-15 minutes to complete and was based on the frequency of behavior observed. Each rater was given 90 days to complete the study and return the paperwork. One hundred and thirty five children and adolescents across the nation were admitted into the study, however only 87 of them completed the study, resulting in a 64% response rate. Of these 87 children, 70 were male and 17 were female (mostly between the ages of 7-10). Forty five were randomly assigned to the Intuipath groups (35 were on ADHD medication and 10 were not) and 42 were randomly assigned to the sand tray groups (29 were on ADHD medication and 13 were not). On average, children in the experimental (Intuipath) groups had higher initial baseline (time 1) scores on the ADHD scale than those in the control (sand tray) groups. Higher scores are indicative of a higher frequency of ADHD symptoms (including both hyperactivity and inattention). The results suggest that both interventions caused an effect over time but the Intuipath groups had a greater reduction in ADHD symptoms than the sand tray groups after 4 weeks. At the time 3 point, the Intuipath group showed a slight increase in total scores, indicating a worsening of ADHD symptoms. However, the overall reduction of symptoms was still a significant improvement from the baseline measure. The results suggest that using the Intuipath over time was positively associated with improvement in behavioral symptoms. The research results suggest that when a child moved both hands simultaneously through a medium such as an Intuipath or randomly in a sand tray, a significant reduction in ADHD-type behaviors occurred. A repeated measures ANOVA (analysis of variance) showed no main effects on ADHD behavior using the Intuipath or sand tray. However, there was a significant interaction between groups and time; Wilks’ Lambda= .094 F (2, 82) = 2.47, p< .10. Overall there is some indication that the treatment, both the finger labyrinth and the sand tray works over time. This can be explained statistically and seen graphically (see appendix A). In statistical terms, significance at .091 which equates to a p-value slightly under .10, does not signify with certainty that the treatment is effective, but indicates that there is marginal significance. Furthermore, p< .10 is considered acceptable in exploratory research. Most scientific studies only report results with significance p< .05. Significance is the alpha test level and is set by the researcher. In other words, the alpha level is the error rate, and can sometimes be more or less lenient depending on the circumstances of the study (i.e. exploratory research). In this case we increased alpha to p< .10 to accommodate the circumstances of the study. Alpha < .05 means that 5 times out a 100, we will reject the null hypothesis when we should not have, also known as a type I error. At an alpha level of .05, there is a 95% confidence level that the reported outcome is a result of the manipulation of the independent variable, which in this case is playing with the Intuipath or sand tray. In exploratory research however, it is acceptable to increase the alpha level to p< .10 meaning a 90% confidence level that the reported outcome was the result of the manipulation of the independent variable. Without accepting a higher alpha level, it is possible that an important interaction might have been overlooked and thus would have resulted in a type II error. This can be compared to a false negative where we fail to see the truth that ADHD behavior did decrease. In this particular study, many variables were uncontrollable and different factors may have weakened the potential for statistical significance. Some limitations of the study include small sample size, unequal groups in terms of gender, age, and medical treatment. In analyzing the results it is necessary to take into account all the possible sources of error to abstain from painting a false picture. Even though there is marginal significance for the interaction between groups and time, these results may be affected by other factors that limit interval validity including history and maturation. History occurs in the time between the first, second and third measurements. Life happens and considering the study was done outside a research laboratory, a host of life events could occur during the study that are not held constant across the participants. These types of factors could affect the treatment, as well as the outcome. Considering the results are fairly consistent across participants, the effects of history are probably minimal. Maturation is the change of subjects over time. Participants naturally change over time; these maturational changes and not the actual treatment may explain the changes in participant behavior during the experiment. Another important factor is the sample used in this study. Perhaps there is something about the people who returned the completed research study vs. those who did not. One hundred thirty five were sent out, but only 87 completed. It is possible that those 87 people share something in common that the other 48 did not. For instance, the parents or school raters who returned the completed paperwork may have been more attentive to their child. They may have been more interested in complementary treatments for ADHD and were therefore willing to take extra measures, such as participating in an exploratory research study. In addition, because the child was not reporting their own symptoms, there is a possibility for rater bias due to expectancy effects. Expectancy effects occur when an experimenter (in this case the rater) unintentionally influences the results of the experiment. The rater can make errors in their interpretation or make errors in recording the data based on their own expectations. In addition, each child was being paid attention to by their rater during the task which could also contribute to their improved behavior at the 4 week mark. Even with all of the limitations listed, the results indicate that children and adolescents with ADHD experience behavioral benefits over time when moving both hands simultaneously through either a Cretan Intuipath finger labyrinth or sand tray.